Set a separate timer for up to five items. Cooks know that timing is everything (lest you really like the taste of charred food). Oftentimes, you've got several items cooking at once. With the DoneRight Digital Kitchen Timer, you can set up to five separate timers so you can avoid kitchen disasters and create delicious meals headache-free. There are four timers on the top of the DoneRight "oven" which cleverly correspond to the four burners on your stovetop. The fifth timer is located on the front to correspond to your oven. 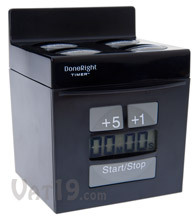 The DoneRight Digital Kitchen Timer is exceptionally easy to use because there are only three buttons per timer: a start/stop button, a +1 minute button, and a +5 minute button. When a timer reaches zero, the DoneRight will flash a light on the corresponding timer as well as sound an alarm. Available in red, silver, and black. 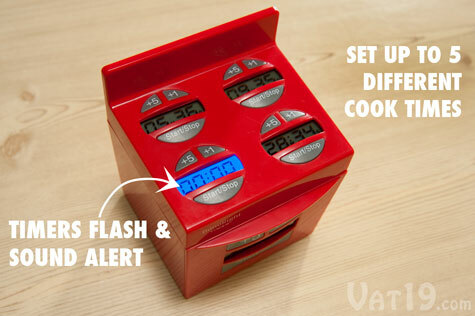 Dimensions: 3.75" x 4.5" x 3.25"
The "mini-oven" DoneRight 5-in-1 Kitchen Multi-Timer was designed with cooks in mind. It's simple to use (only 3 buttons per timer), with four timers corresponding to your stovetop burners and one timer corresponding to your oven. So, when a timer goes off, you know what it's for! Brilliant. Organize your cooking with the 5-in-1 Kitchen Timer. 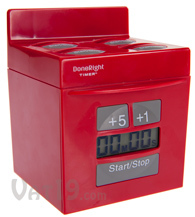 You can set up to five different timers with the DoneRight Digital Kitchen Multi-Timer. There are four timers on the "stovetop" and one on the front of the "oven". When a timer goes off, it will beep approximately ten times and a blue light will flash for a minute. You can turn off the timer by simply pressing the "Start/Stop" button. 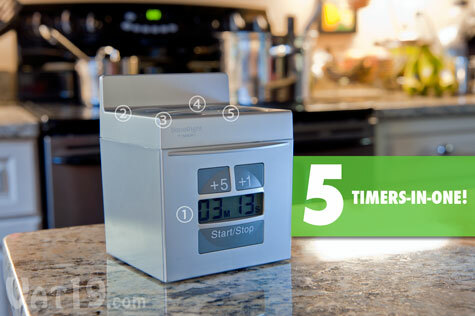 With the DoneRight Digital Kitchen Multi-Timer, you can set up to 5 different timers. Each of the five timers on the DoneRight Kitchen Timer is controlled by three buttons: a +5 minute button, a +1 minute button, and a Start/Stop button. 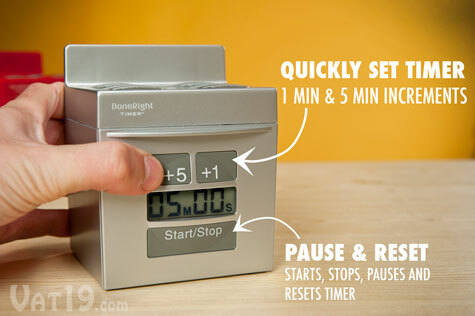 The DoneRight Timer is so easy to use that you won't probably even need instructions. But, here's a little more detail for you irrational people who want to know how something works before you purchase it. +5 minute button: Adds 5 minutes to the timer. +1 minute button: Adds 1 minute to the timer. So, you need to set the timer for 13 minutes? Press the +5 minute button twice and the +1 minute button thrice. Or, if you're zany, press the +1 minute button thrice-teen times. Start/Stop button: Press to start your timer. You can also press this button to pause the timer. Press and hold to reset. When the timer is beeping or flashing, press the Start/Stop button to turn off. 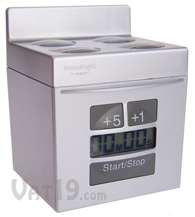 With only three buttons per timer, the DoneRight Kitchen Timer is exceptionally easy to operate. 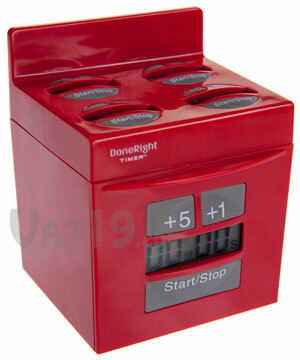 The DoneRight 5-in-1 Kitchen Multi-Timer is available in red, silver, and black. Buy all three because you never know when one of those home remodeling shows will do a makeover on your kitchen and completely change the color scheme. You should be prepared with at least one of each color! Question: How do I know which of the five timers is going off? Answer: The beeping sound alerts you that one of the timers is finished. The individual display for the timer will flash a blue light so you know exactly which one is going off. Question: What if I only need two simultaneous timers? Answer: Each timer is set separately, so you can use any number of timers (up to 5). Question: What is the maximum length of the timer? Answer: Each timer can be set to a maximum of 99 minutes. The shortest timer is 1 minute.